What do you need to improve email security? Full control over access to mailboxes is probably at the top of your list. You need to keep an eye on every change to Office 365 mailbox permissions, because any unwarranted privilege escalation could threaten your data. Specifically, to ensure that no Office 365 users obtain inappropriate email permissions, you need a way to efficiently monitor who changes what mailbox permissions and when and where it happens, so you can quickly remediate suspicious alterations in order to protect sensitive mailbox content and prevent data leakage. 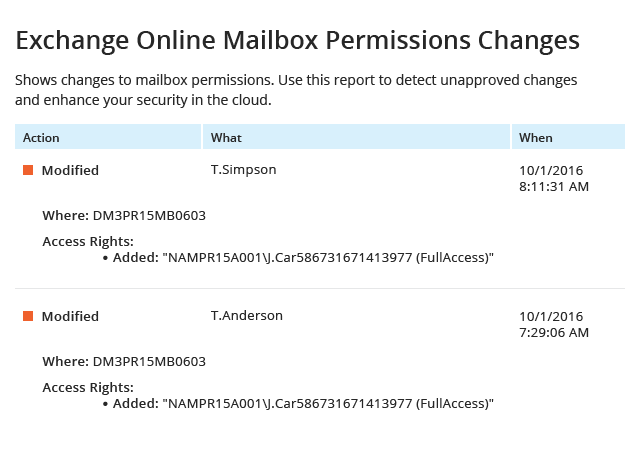 When someone adds, removes or modifies mailbox or shared mailbox permissions in Office 365, you need to be the first one to know about it, so you can immediately detect and block external attacks or malicious user behavior. You can monitor Office 365 mailbox permissions using built-in tools. However, be ready to spend significant time in the audit search, playing with filters and digging around until you find the information you need, always dreading that a suspicious change will go unnoticed. Since there are no predefined reports on mailbox permissions in Office 365, every time you need to see who changed what permissions, you’ll have to generate a search, manually export the audit data into Excel format and then work at making it at least a bit easier to read. Do you really have time for that? Isn’t there a more efficient way to identify suspicious activity that could threaten your email content? Netwrix Auditor for Office 365 helps you gain 360-degree visibility into what’s going on across your Exchange Online, SharePoint Online and OneDrive for Business environments, including how Office 365 mailbox permissions are being changed. This intelligence will help you strengthen email data security by enabling you to spot and block threats before it’s too late. Identify unauthorized changes to Office 365 mailbox permissions faster with easy-to- read predefined Office 365 activity reports, and manage permissions more effectively. Have the reports you need delivered automatically on the schedule you set, so you can always be on top of mailbox permissions changes and other critical Office 365 activity. Expedite investigations with the Interactive Search feature and determine the true root cause of a problem in minutes. Safeguard your critical email data against internal and external attacks with alerts on critical activity. Keep your audit information stored securely for years in the cost-effective two-tiered (SQL database + file-based) storage, and easily access it during your next audit check or in-house investigation.